The existing Monterey County Government Center North Wing, built in 1966, is a 3-story building with one basement level. The building is located in close vicinity of the San Andreas fault. The existing building is a steel frame structure clad with precast concrete panels. The existing structure did not satisfy the current building code requirements. In a major seismic event, the steel frame, precast concrete panels and their connections would most likely suffer severe damage. The goal of the seismic retrofit was to alleviate the structural deficiencies and meet the life safety performance level as required by FEMA-356 guidelines. The original retrofit scheme was to use rigid steel bracing from the first level to the roof. Introduction of new braces on the third level was not acceptable to the County due to interference with the mechanical system. 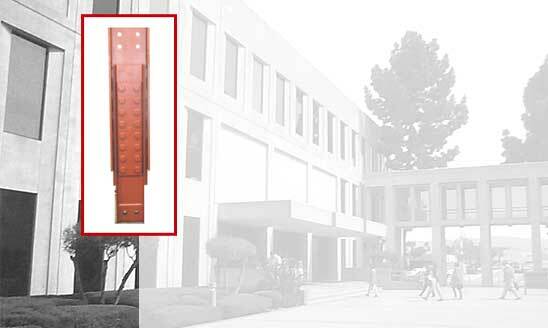 The alternate scheme of incorporating seismic dampers in the steel bracing provided an ideal solution for the seismic retrofit as the need of bracing in the top story was eliminated. Pall Friction Dampers of slip loads 200 - 250 kip capacity were used. The use of friction dampers resulted in significant reduction of seismic forces, reduction of story drifts and reduced cost of construction. Seismic retrofit was completed in 2005.